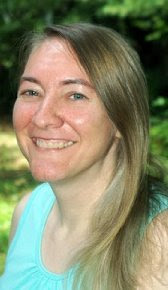 Today I have the pleasure of hosting Jennifer Hubbard, author of The Secret Year, for an interview. The Secret Year is Jennifer's debut novel and was released in paperback on December 23rrd, 2010. Click here to read my review. 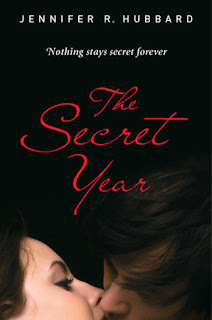 Your debut novel, The Secret Year, recently came out in paperback and got a cover makeover. What are your thoughts on each of the covers? What strengths do you think they each have? I loved the first cover. The kiss captures the attraction between the main characters. The darkness of the cover, and the fact that you can’t see their full faces, brings the right air of mystery and secrecy. I’ve blessed Sam Kim, the designer, a million times for that cover. I also love the fact that I get the chance to see another interpretation, with the paperback cover. This time we get to see Julia’s face, and I have to say her expression really fits the character. The light-colored background will be a nice relief from all the dark covers in YA. Seeing the covers was one of my favorite parts of the publication experience. It’s just so exciting to get to see a visual depiction of your work—a depiction that will represent it in bookstores and all over the internet. NOTE: The cover I've shown above is the hardcover, and the one below is the paperback. We see some aspects of The Secret Year through Julia, the eyes of dead girl. What inspired you to write from this perspective? That grew naturally from the story. The fact that Colt got hold of her notebook was part of my original idea for the story, so—we definitely had to find out what was in it! And as I wrote, I realized that it’s a fantasy many of us probably have: to be able to find out what was going on in a romance through your partner’s eyes, with all the insight and discomfort and regret and nostalgia that can bring. Colt has to cope with his grief over Julia’s death throughout the novel, and while he isn’t perfect I enjoyed reading about him. Can you tell us more about how his character was born? I had the idea for the story: a secret relationship, a dead girl, a notebook left behind—but I didn’t start writing until I had Colt’s voice in my head. He started speaking to me, and I listened. One thing I’ve noticed about grief in real life is the incredible spectrum of experiences people have. Most of the time, people do go on about their daily lives, and the emotions of mourning often come in bursts or waves, some of them delayed quite a bit. Some of Colt’s actions come from his own personality, his strengths and flaws. But a few of them are also products of the grieving process. He gets blindsided by some emotions late in the book that he had thought were behind him; he didn’t expect he would have more layers of loss to cope with. Are you working on any projects right now that you can talk about? The book I’m working on right now is also contemporary YA, also with a male narrator. This character’s problems are very different from Colt’s. His family and his financial situation are much more stable than Colt’s, but his inner resources are much shakier. He’s trying to come back from the brink of something. I’m very interested in how people put their lives back together after they’ve gone deep into trouble. What books have had the strongest effect on you as a person and as a writer? Jack Kerouac’s writing has influenced me a lot—the rhythm of it, his skill at picking out the most telling specifics, the way he describes even the most miserable settings in loving detail. But really, everything I’ve ever read has probably influenced me in some way. How do you spend your time when you aren’t writing? Do you have any hobbies or activities that you enjoy? I see that you sometimes tweet about taking long walks. Yes, hiking is one of my favorite activities, and I walk at least a mile every day. I love to read, of course. I go to gamelan concerts twice a year, and taiko concerts whenever I get the chance. Tennis is my favorite spectator sport, and I watch the Grand Slam tournaments. I also watch the Olympics whenever they’re on, and my husband has gotten me into watching the Tour de France. At various times in my life, I’ve played piano, done embroidery, played volleyball, and taken art classes. You’re stranded on a desert island and you can choose five items to have with you. What do you select? Thanks so much for stopping by, Jennifer! If you haven't already, be sure to check out The Secret Year. Thanks for the interview! I loved this book. =) I personally like the paperback cover better, but both are gorgeous. I can't wait to see more of your work, Jennifer!